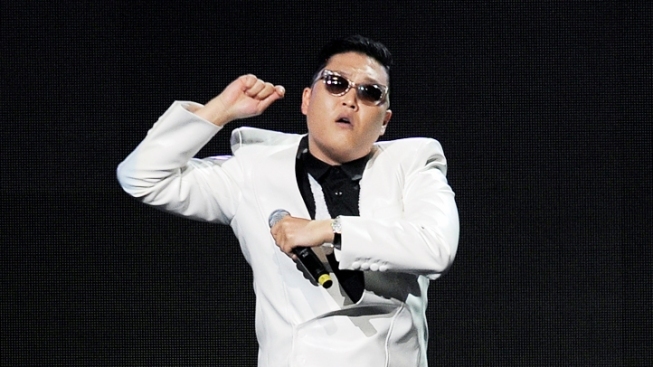 PSY's "Gangnam Style" has become the unexpected music hit of 2012. South Korean rapper PSY is still scheduled to perform at Sunday's "Christmas in Washington" concert at the National Building Museum after he apologized Friday for performing songs with anti-American lyrics at a concert protesting the U.S. military presence in South Korea during the early stages of the Iraq war in 2004. The 34-year-old PSY, born Park Jae-Sang, said he was "deeply sorry" for performing the song "Dear American," a song written by the South Korean metal band N.E.X.T. In reference to American soldiers, the song includes the lyrics "Kill their daughters, mothers, daughters-in-law, and fathers/Kill them all slowly and painfully." At another concert, PSY smashed a model of a U.S. tank on stage. "While I'm grateful for the freedom to express one's self, I've learned there are limits to what language is appropriate and I'm deeply sorry for how these lyrics could be interpreted," PSY's statement read, in part. "I will forever be sorry for any pain I have caused by those words." As a young man, PSY attended college in America, studying first at both Boston University and then Berklee College of Music, but he later returned to South Korea without earning a degree. PSY recently shot to unexpected stardom after the music video for his song "Gangnam Style" went viral and became YouTube's most-accessed video ever. The song itself, which is performed almost entirely in Korean, has also earned heavy radio play in the United States. The "Christmas in Washington" concert, which the First Family is expected to attend, will be filmed Sunday for broadcast December 21 by TNT. Representatives for the network, which has final say over the selection of performers, told NBC News that PSY would perform as scheduled. The program is hosted by Conan O'Brien. Other scheduled performers are Diana Ross, Demi Lovato, Megan Hilty, Scott McCreery, and Chris Mann.